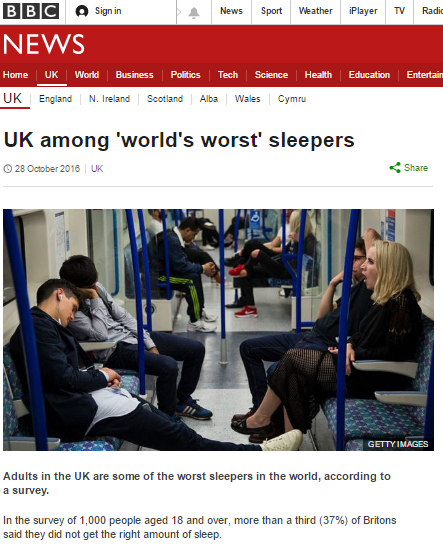 Adults in the UK are some of the worst sleepers in the world, according to a survey. In the survey of 1,000 people aged 18 and over, more than a third (37%) of Britons said they did not get the right amount of sleep. People in India scored the best in the survey, carried out by Aviva, with 9%. 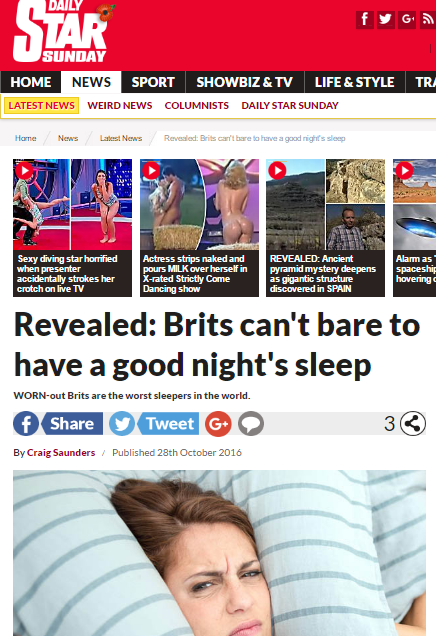 WORN-out Brits are the worst sleepers in the world. More than a third of people in the UK feel they are not getting enough shut-eye. Experts blamed the problem on the 24/7 working culture, addiction to mobile phones, and anxiety. Some 37% of Brits want to doze off for longer followed by the Irish (34%) and Canadians and Americans (31%). 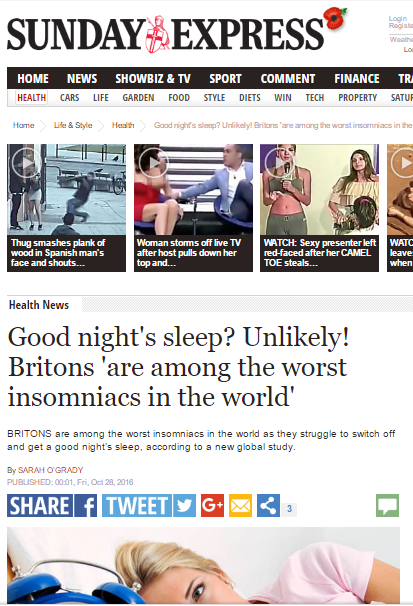 BRITONS are among the worst insomniacs in the world as they struggle to switch off and get a good night’s sleep, according to a new global study. Research comparing the sleep patterns of people in 13 countries across Europe, North America and Asia found 37 per cent of UK adults complaining they do not get enough sleep – the highest proportion of any of the countries surveyed. The problem is so bad, a quarter of people now list getting a better night’s rest as a health ambition, second only to the desire to lose weight (34 per cent). We’re world-beaters when it comes to drinking tea and queuing. 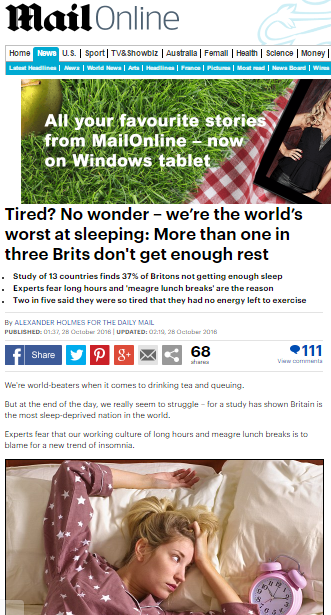 But at the end of the day, we really seem to struggle – for a study has shown Britain is the most sleep-deprived nation in the world. Experts fear that our working culture of long hours and meagre lunch breaks is to blame for a new trend of insomnia. The message right across the media is clear: our hectic, 24/7, non-stop lifestyles are causing us to neglect sleep, driving us all toward an early grave. But who is behind the story, and what do they stand to gain from making us all worry about our health? The life insurance wing of insurance company Aviva put this story together – presumably figuring that if we can make people consider their own mortality and morbidity with a well-placed reminder of what can happen when we don’t prioritise our health, they might be able to convince a few more people to take out life insurance cover for when ‘the inevitable’ happens. Three in ten families plan to take action to improve their sleep over the next 12 months, compared to just 20 per cent who did this in 2015, found the latest Aviva Health Check survey. What is particularly fascinating about this story is seeing the way the same information was presented in each different news outlet, as each either ran the Aviva press release through their own filters, or (as is more likely) ran stories based off a press release Aviva’s PR team had tailored to the style and interest of each publication. The days of the mass-mailout press release are dead: PR firms these days know that scoring the widest spread of coverage means approaching each publication with a story already suited to their style and readership. This entry was posted in Aviva on November 5, 2016 by Michael Marshall.